We caught up with SAI Ambassador Christian, who reflects on his time in Rome. My on-site urban sociology class was definitely my favorite because we met, mostly, in Rome instead of in the classroom. The professor for this class was Roman, so we learned some fascinating information about the city and saw spots in the city we might not have known about. 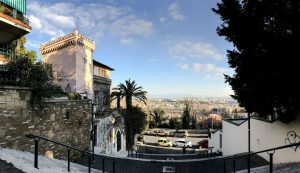 I really loved being able to use Rome as my classroom because it connected me to the city and to the material. Rome is known as the “Eternal City”, and while there is so much history, it is also a dynamic and energetic place. The Roman Forum and the area around it has gone through a lot of changes. One day we had class on a balcony overlooking the Forum and used picture handouts to imagine this area in different time periods. There was a time when the Forum was only used as a field for animals! Then our professor taught us about more modern Italian history, starting from unification, and we were able to look around and see the effects of this history and visualize the urban changes he was talking about. Finally, he told us that there used to a thriving neighborhood right where we were looking at, but it was demolished to create a road to lead to the Colosseum. 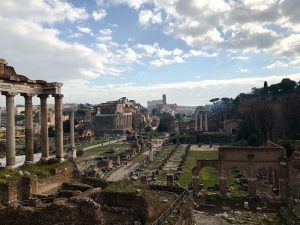 I loved taking this on-site class because it taught me to see the different sides of Rome and to appreciate the historical, political, and cultural circumstances that produce the city we see today. My best advice is to look for authentic and fulfilling experiences in the places you travel to. While it is important to see iconic landmarks and sights, make sure you give yourself time to explore the area in meaningful ways. I discovered after a solo trip that one of my favorite ways to travel is to not worry about seeing everything, instead, I like to focus on absorbing the energy of where I am. 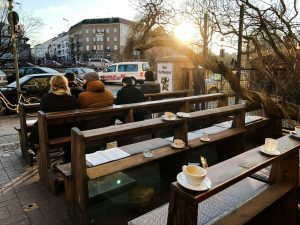 I felt more satisfied and connected to the places I went when I walked and explored neighborhoods without a long list of things to do and a strict schedule. While you will not always blend in, try and respect where you are and attempt to understand what real life is like in the destination. It is easy to have a built of view of how different cities or countries are, but keep an opened mind and have a positive attitude! If you go on a trip with stereotypes in your head and do not make an effort to explore, you are bound to be disappointed. I did a lot of free walking tours because they were great to get an overview of the city and learn about the the culture and history of the city from a local. Try out different travel styles to find out what is most fulfilling to you. A semester abroad is the perfect time to get out of your comfort zone and try new things! View overlooking the ancient Roman Forum with the Colosseum in the background. Not a bad spot to meet for class! 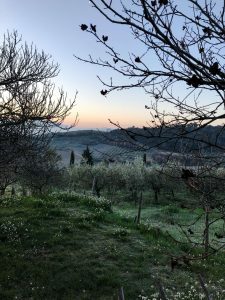 When I reminisce about my semester so many wonderful moments come to mind, but I always end up thinking about a weekend trip to the Umbria region in Italy with SAI. From start to finish, it was amazing and filled with beautiful vistas, delicious food, and lots of laughs. We were able to relax in the stunning countryside, explore incredible caves, learn to create iconic chocolate creations, stroll through picturesque villages, and, of course, eat!. My favorite memory from that trip was one of the dinners at the Agriturismo we were staying at. My table enjoyed a seemingly endless amount of food and could not help but feel relaxed and carefree. We all talked and joked like we had known each other for years. My stomach hurt from laughing so much that night. This was the moment I felt like I had a really strong group of friends and Italy felt a little more like home. We clicked so well and developed a strong and beautiful friendship after that trip. So that has to be my favorite memory because it was so pure and a lot of the memories I have from throughout the semester stemmed from that trip. It is safe to say that Umbria set the the bar high for the rest of my trips! I walked up a lot of stairs to get up to this neighborhood, but the views were worth it! Going abroad was an incredible opportunity that I am so grateful to have had. I dreamed of going to Italy, where I have family heritage, but it never seemed possible. Prior to my semester, I had only been outside of America once. 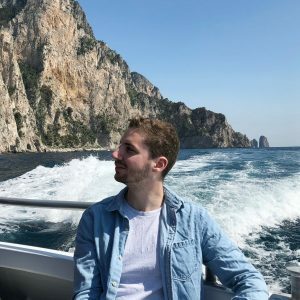 During my semester I was able to travel to twelve amazing countries and experience some incredible thing such as going to the top of a hill full of ancient Roman pottery, skiing in the Swiss Alps, enjoying a snowball fight in front of the snow-covered Colosseum, going into the scavi underneath St. Peter’s Basilica , and much more. I see my semester as a formative and important part of life that will forever shape the way I view myself. Now, I am more confident in my ability to deal with changing environments. I learned how to problem solve and deal with unforeseen circumstances and stress. My time in Rome has opened a world of opportunities and possibilities. I came back from my study abroad with new friends, countless memories, newfound self confidence, and a fresh perspective on the world. The view from the agriturismo we stayed at in Montefalco in the Umbria region of Italy. It was quite easy to relax here and enjoy the countryside! Hands down my favorite thing to do in Rome was to wander. I loved walking around the streets with my friends and enjoying the architecture of the city. Walking was the way that I participated in my host city and it let me see a very intimate side of Rome. By the end of the semester, walking just became part of my life. Rome is very walkable and my friends and I could take a little stroll from campus and be at the Colosseum, or a park for a picnic, or our favorite gelato shop. On my walk home from class I would often take a longer route and wander around, especially through this one beautiful and calm neighborhood on the hill above my neighborhood. I could explore up there if I needed a little break from the hustle of the city. After those walks I always felt recharged, relaxed, and inspired to keep adventuring! I spent the day exploring the funky neighborhood of Kreuzberg, Berlin with some friends I met at my hostel. We stumbled upon this coffee shop and loved the creative seating. Christian was an SAI Rome spring 2018 student from University of Mary Washington.